Teacher materials for Cambridge Advances Sciences Pre 2008 specification. For new resources see Cambridge OCR Advanced Sciences. 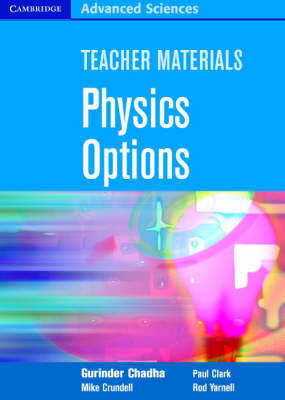 Physics Options Teacher Materials complement the following OCR approved Cambridge Advanced Sciences Physics options titles: - Cosmology - Telecommunications - Health Physics - Nuclear and Particle Physics. The materials help you deliver teaching of the A2 options by providing student and teacher checklists, worksheets, model answers, teacher guidance, practical guidance, end of chapter tests, and answers to worksheets and end of chapter tests.